High winds and rough seas caused a truck to overturn on the car deck of the "Gaudos" on Jan 30, 2015, shortly after 7:30am, while the ferry was underway from Malta to Gozo. No one was hurt in the incident, but there were delays as the "Gaudos" currently was the only ferry in service. The "Gaudos" brushed against a quay in Mgarr on Apr 21 around 8 p.m., whilst coming from Valletta, and scraped away some of its paint work, while entering port. According to operator Gozo Channel the safety of the passengers on board andthe vessel were not put at risk. Gozo Channel apologised for the incident. On Apr 22 at 7.35 a.m. the ferry left port again. The "Gaudos" is back in service after its ramp was fixed. The loading ramp developed a fault on June 1, 2012, and was not fixed on time for the ship to be back in service on June 2 morning. This caused long delays for those that needed to cross between the two islands. 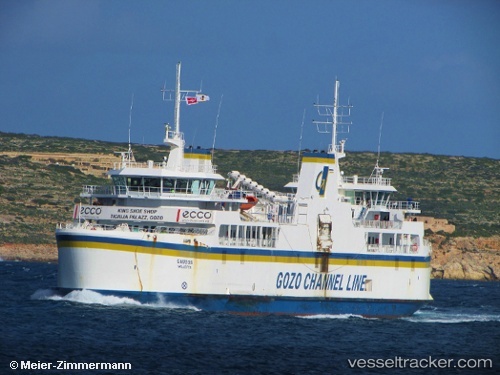 Until the "Ta’ Pinu" is back on service, the Gozo ferry service will continue to be provided through the "Gaudos" and "Malita". Meanwhile work on the installment of the hoistable decks on the "Ta’ Pinu" was progressing according to schedule and the ship was expected to be back in service shortly.